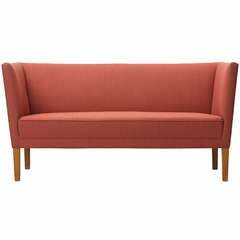 Settee by Mito Block Brothers A signature style settee by the Mito Block Brothers in Mexico City made in ebonized mahogany and square form brass caps on each leg. 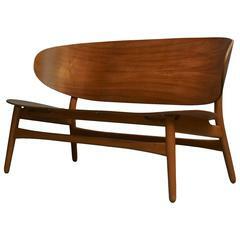 The back features a horizontal ladder back design with the upholstery being a terracotta linen. Mexico, circa 1950s. 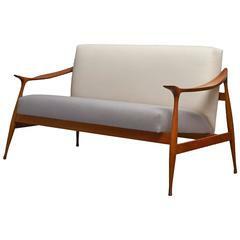 A “Lord” settee of walnut and upholstery by Ico Parisi for Fratelli Reguitti. 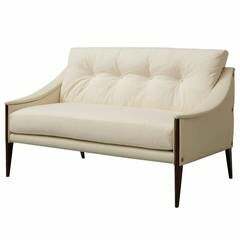 An early high-backed settee on squared legs having a tight and tailored pale brick upholstery. 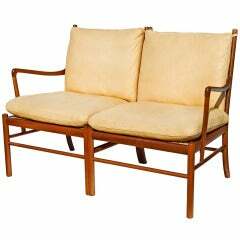 Rustic modern two-seat sofa made of Eco-friendly Palmwood and New Zealand leather. 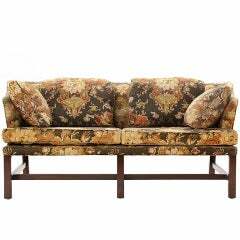 A sofa of English inspiration, retaining the original dark olive, coral, brown and beige mock-Asian floral print linen upholstery, on straight dark walnut legs. 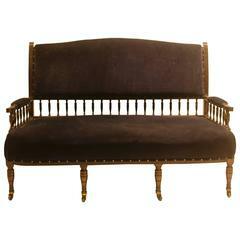 A very nice fruitwood Venetian settee made in Italy during the third quarter of the 18th century. 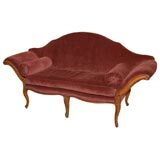 Recently tightened and reupholstered. In great restored condition.